This is the beginning of Chocolate Zucchini Muffins. Or Zucchini Bread. Whichever we are in the mood for. I stayed up late last night processing giant zucchini and now have 26 cups of shredded zucchini in my freezer, all stored flat in 2-cup portions. 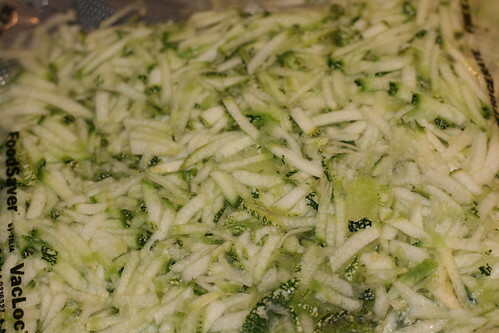 And since the zucchini are still a’coming, I should have plenty of fresh zucchini for my “Mock” Apple Pie. Do you think my crew will fall for this again? Just in case someone wants it, here is my Chocolate Zucchini Muffin recipe. I like it without the chocolate chips, but with chocolate chips it tastes pretty much like a brownie. We usually double the recipe. These don’t last long around here. Fill muffin cups about ½ full and bake 14 – 15 minutes. Previous Post I finished my Work of Art . . . . .